This week I lost a good friend. Rich was the foundation and hub of my old gaming group (TWA). I met him and another friend about 25 years ago at some local conventions, and was invited to their club's annual game day & regular game nights. Game nights were Wednesdays at Rich's house. 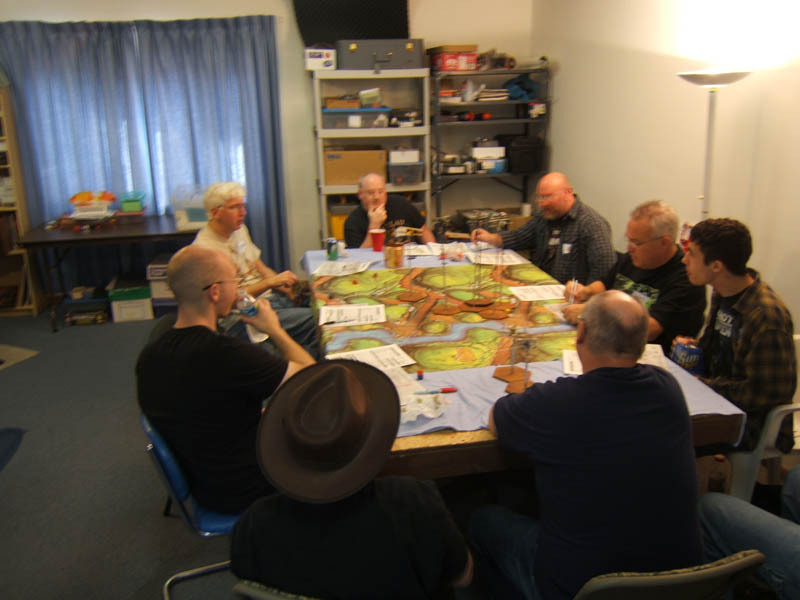 There was a bi-monthly schedule, with club members taking turns running games. Rich was always the good host, making sure everyone felt welcome, had snacks & drinks. The usual game nights waned and then disappeared in recent years as some of the regulars moved away, or became busy with other aspects of their life. There's still been gaming going on, in a less formal way maybe. Rich still invited his old friends over. It wasn't all gaming. We had a mutual knack for getting lost in conversation and especially a fondness for history. I would frequently be the last one to leave after a game after we rambled on for hours. I painted miniatures on commission, to pay the bills when I was in college (and beyond.) So I sometimes painted figures for Rich and the simple act of dropping off some painted minis was a task that could take the better part of the afternoon. For many years, we had a sort-of revolving account for painting minis rather than any cash trading hands. I was usually broke when I was in school, and would have never been able to travel to the HMGS conventions & other events. So Rich would frequently offer to cover my share of the bills and I would pay him back by painting. On rare occasions I would even get ahead of the expenses! I would never have had all of those good times with him and our other friends if he hadn't done that for me. We always drove from Ohio to Lancaster, Gettysburg, or wherever. So we had some long drives for even more talk. Rich hosted quite a few games at the conventions. He was also a master of the flea market -- somehow always finding the best, almost unbelievable, deals. He was an equally shrewd negotiator/salesman when manning our shared/club table at the flea market. Rich was challenging opponent, but always (OK, mostly...) a good sport. His love of WWI history and gaming was contagious and was the spark that lit my own interest in that period. As I said, he was always a thoughtful host, but beyond that he was a thoughtful friend. I can't say the same for me, and so Rich was the one who always checked in with me to see if was OK when I got swept up in school, work, or whatever. I know he's kept up with other friends in the same way, since he's been the link that's kept me in touch with, or at least informed about, some of our other friends. This isn't a very eloquent eulogy. I've re-written it several times in the past few days. I'm not sure how to put in to words what a great friend and wonderful person Rich was. But I wanted to put down something. I'm devastated by his death, and disappointed by my own failings as a friend. We had been emailing back and forth about getting together, but for months I just couldn't tear myself away from everything else to make time for someone who always had time and concern for his friends. After his memorial service this afternoon, I had a family dinner to travel to. The road took me near his house, so I stopped by and parked out front for a while. I've spent a lot of time at that house. The memories that hit me were almost like hallucinations, I swear I could see us loading up his car for a trip one minute, then standing on the front stoop talking til the sun went down, as it was at that moment, the next minute. I could see through the walls, look in to the living room, the game room in the basement. I know I've got more photos somewhere... old ones, probably on old CDs buried in the basement. But this is sadly the best I can do at the moment. Rich is on the end, overseeing a WWI aerial game (Blue Max/Canvas Eagles?) at a Game Day a few years ago. I'm guessing I was already knocked out -- as much as love the game, I've never been very good at it. This was the last thing I painted for Rich. I previously posted it on this blog, back when I painted it. I think it was in exchange for some minis he gave me. 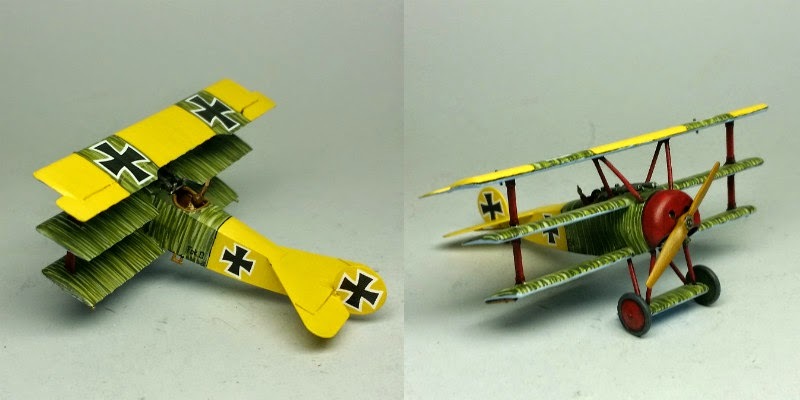 It's Lothar von Richthofen's DR.1. The gaming world lost one of the good ones. anew job,I didnt take the time,and now itll never come again. I too am devastated,and will mourn for a long time. If this is Bruce, can you email me at zerotwentythree@gmail.com or call Ron? I'm also trying to deal with feeling awful about not getting together for one last game. We had been talking about it for a while, but I've been too busy and now I've missed my chance. Not sure how to fix my schedule, but I feel like this is a warning, that I need to spend time with the rest of my other friends while we all have the chance. As a follow up I contacted Ron. Tom was he cremated or buried and isthere a marker that I can visit? I have to say goodbye,I really need that closure.Thanks,Bruce. Sorry, just saw this reply. It got filtered by Blogger but I didn't get a notification. He was cremated. I was at the memorial, but I felt like I didn't really say goodbye until I went & parked outside his house, as I described above. That really hit me hard and I broke down in tears. I stopped by his house after Christmas-he lived only a few streets from my moms house. It kind of threw me for a loop as the porchlight was on as it had been so many times before.You used to play 40K didnt you? Ron was talking about having some KillTeam days. I heard about possible Kill Team or something coming up. I'm hoping to make it for that.